Once again, fire in Santa Barbara/Montecito. Blood Sister phoned two hours after the blaze ignited. Her power was out and I became her eyes with our TV and laptop. She and her family had rushed to the hill at the top of their Mesa street. 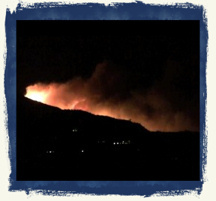 They watched flames illuminate the ridge of Santa Barbara’s riviera. Then the smoke hit. Then ash. KCAL 9 was the only station in LA reporting consistently on the fire when I tuned in–but they didn’t know much, I told Blood Sister. One of the KCAL newscasters asked a Santa Barbara official on the official KCAL 9 Newsline/Hotline if the Starbucks on OLIVE HILL ROAD was threatened. Slight hesitation from the Santa Barbara official. No, the official replied in a terse monotone, Olive Mill Road is not threatened as of now. Well, thank the stars Starbucks is okay, Blood Sister commented wryly. Then the newscaster wanted to know about Oprah’s mansion. There are many homes up there, the Santa Barbara official stated (as would other Santa Barbara officials in days to come for newscast after newscast). From mansions to modest. I don’t know about Oprah’s place at this time, the Santa Barbara official concluded. Well, the newscaster pressed, how about Rob Lowe’s estate? Montecito roads are narrow and winding—very pay-attention roads, especially at night. Horrible roads for fire trucks to maneuver in a major fire crisis. Um–they’re evacuating above Westmont College, I told Blood Sister. All I saw on the TV screen was wind-fanned blaze. I touched my forefinger to the screen, counting out loud for Blood Sister. When I got to 24 houses burning, I stopped counting. 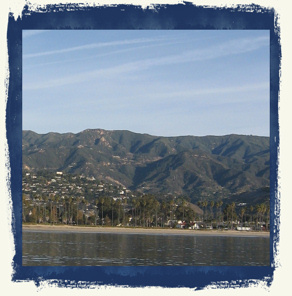 Not only the rich live in Montecito or the foothills of Santa Barbara. There are plenty of fixer-uppers, funky ranchstyles and tracts from the 40’s/50’s. It’s hard to make a living in Santa Barbara, but plenty of people find a way that doesn’t involve major moviestardom. My family have been there since 1968. My mom is a piano teacher. One sister, a realtor. The other, a gallerina. I have friends who are teachers up there. Poets, writers, artists up there. I’m going back for good one day with my little family. Blood Sister’s power snapped back on and we disconnected. This morning she tells me my niece was evacuated and showed up on her doorstep at 1am, panicked, hoping she’d grabbed the “right” items—photo albums, her mom’s important file box. No one had been able to reach my niece’s mom vacationing in Virginia. She’s due back today, but won’t be allowed up to her home. Blood Sister’s ex-husband was also evacuated and many of her friends. Her house has become Fire Central (how her husband answers the phone). It’s terrible. It’s awful. And we’ve been through it before. My sweet little toy-town hometown is a fire magnet. In 1977 the Sycamore Canyon Fire (Santa Barbara) burned 195 homes in something like a scant 7 hours. I remember looking up from my beach towel the day after and watching the wall of smoke approach the ocean at my back. At the time, I had no idea how devastating that fire was, or just how close it came to roaring into downtown-ish. When we were kids and living with my dad on the Mesa, he was always spotting wildfires from our house and packing us up in the car—day or night—to go and have a look at the flames. Look at that, girls! he’d tell us as we gazed dutifully out our station wagon’s windows at firefighters battling vicious flames (these days my disaster-fanatic dad would be busted by CPS). This is a once in a lifetime sighting! my dad would proclaim, although it never was. After hanging up with Blood Sister, I stared numbly at the fire on TV, then called it a night when my husband stuck “Madascar” into the DVD player, his copywriting homework for the evening. Around 3am I woke with a start. My son had been quiet for almost 7 hours. Unheard of. I snuck into his room and detected reassuring breathing, so returned to bed. At 5am he woke us with the usual gaspy/angry cries. I fetched him into our bed and noticed with horror that he was hot–hands, feet, head. On went the lights. We administered the Tylenol. We took his temperature. 100 degrees. We discussed the fever. T had been given 2 shots the day before and I worried he was having a reaction. We decided to wait until morning and call the doctor, vs. totally freaking and rushing him to the ER with our heads spinning around on our necks. We turned out the lights and all slept. By 7am my baby’s fever was gone and, according to the TV, 100 homes burned to rubble by the Tea Fire. This entry was posted on Saturday, November 15th, 2008 at 02:16 and is filed under BABY BABY, Noho, Usual Drama?. You can follow any responses to this entry through the RSS 2.0 feed. You can skip to the end and leave a response. Pinging is currently not allowed. Great fire and fever accounting, PB! So true about the Mansions hype. So little coverage in VIrginia on the fire. If it hadn’t been for the mansions and celebrities, would there have been ANY coverage? Glad T’s fever went away. Poor little guy. Thanks, Suze. I don’t go to Starbucks anymore. I cope with our struggling economy by using coupons to buy ground coffee from Ralphs. I brew my own coffee now. Blrrrrrrgh. But who cares. People I know lost their HOMES. Am going to help however I can.